My name is Alex Ross and I’m currently studying for an MA in English Literature at Bangor University, specialising in Welsh Writing in English. I was lucky enough to be granted a scholarship through the ATM project at Bangor University. The purpose of the scholarship is to support my study as it corresponds to one of the Welsh Government’s priority sectors. More information can be found on the ATM website. Part of the scholarship includes a work placement with an industry partner. Whilst I gain transferable skills that make me an employable graduate, my research should help boost the local Welsh economy. I have been partnered with Palas Print an independent bookshop based within Caernarfon’s town walls. 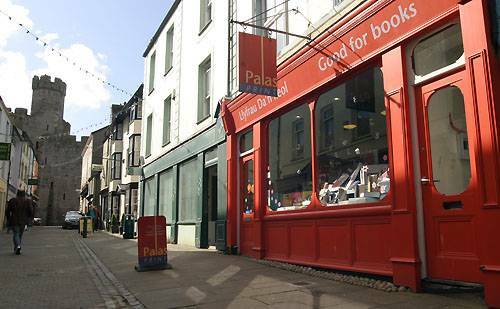 Palas Print offers a selection of Welsh and English Literature and also has a shop based in Bangor City Centre. Listed in The Independent’s ’50 Best Bookshops’, it is a privilege to work with a company that is as passionate about Welsh literature as I am. This blog and hopefully the fruit it will bear in the form of a book group should prove how my degree can support and improve the Welsh economy. I aim to blog as regularly as possible about the rich and diverse examples of Welsh literature Wales has to offer in the English language. With help from Palas Print I will establish a book group where members of the local Gwynedd community are able to meet and discuss Welsh Writing in English. My main aim is to promote and make Welsh Writing in English accessible to a variety of readers, proving that the canon of Anglophone Welsh Writing is relevant to many people and a vital part of contemporary Welsh culture. I am currently co-ordinating the first Penodau Harlech Chapters, a literary festival. I’d like to invite your bookclub to have a special meeting at the festival. Would you be interested? Also, we plan on having stalls and could offer Palas Print one. You can contact me on details below. Hope to hear from you, the sooner the better please as time is short!